← Now blogging for Test & Measurement World! I recently wrote a short review article on the $129 RF Explorer spectrum analyzer for Test & Measurement World. While this is an amazing accomplishment for the price, there’s a better design coming shortly. The new model, the WSUB3G, will tune from 15 MHz through 2.7 GHz and is expected to sell for $269. The style is identical to the current WSUB1G model as shown below. Here is the original RF Explorer, model WSUB1G, measuring the harmonics from a demo crystal oscillator board. I'm using a Beehive Electronics h-field probe directly connected to the input port of the analyzer. Several improvements have been made to the new analyzer. Besides the expanded frequency range, the front end is now protected up to +30 dBm (was +5 dBm). Several other enhancements have been made to the user interface as well as several additional features to make the instrument easier to use and more versatile. 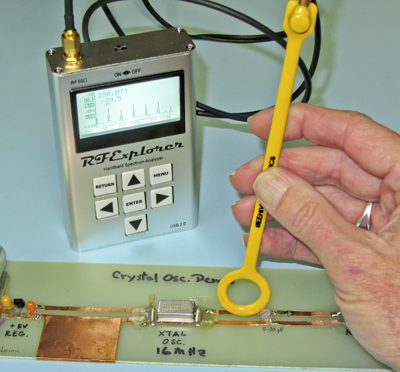 More information on the analyzer may be obtained from their web site at www.rf-explorer.com. Im interested if anybody has been able to do an amplitude accureacy test on the 15-2700 MHz model. I am particually interested in say 50Mhz, 200Mhz,400Mhz and 800Mhz just to get an idea of what to expect. +-5dB would seem OK for a unit like this but I wonder. I’ve done some informal testing on absolute accuracy and it’s really not too bad…maybe +/- 3 dB, or so. For better accuracy, I recommend the Rigol DSA815.